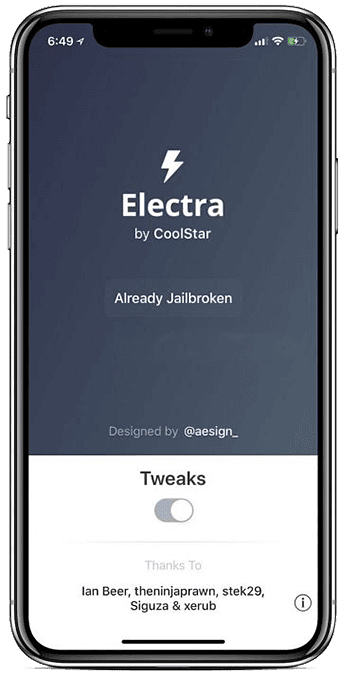 Good news for all jailbreak fans, Electra Jailbreak has just been released. Before you get too excited though, it cant be installed in the same way as we used to install jailbreaks. However, this is the first time we have seen any kind of jailbreak utility in more than a year and it comes to us from popular developer team, Coolstar ( twitter ) . It works on loads of different iOS devices, providing us with our tweaks and apps once more. Back to installing it. Electra Jailbreak is a bit different to previous jailbreak tools, mainly because it is a semi-untethered utility. What this means is, because we need to install it in a different way, the jailbreak will need to be reactivated whenever your device is restarted, regardless of the reason why. Electra does have support for Cydia substrate though so all your favorite tweaks and modifications will still work. Install Panda Helper on your iOS device following the linked guide. Do be sure to use the comments box below to let us know if you encounter any problems installing or using Electra app. It is quite a new jailbreak and we will help you to solve any issues wherever possible. If needs be, the jailbreak can be deleted easily. Electra Jailbreak isn’t quite the same as the jailbreaks we used before. It does offer plenty of tweaks and modifications though and it is a very welcome jailbreak utility, the first of many to come with any luck. Let us know what you think of Electra and follow us on Facebook for all the latest jailbreak news.